Tenmabashi Bridge (天満橋), Osaka. The bridge was together with Tenjinbashi and Naniwabashi considered to be one of the Three Large Bridges of Naniwa (the historical name for Osaka). While most bridges in Osaka were built by business people, these three were managed directly by the Tokugawa Shogunate. Such bridges were called Kogibashi. 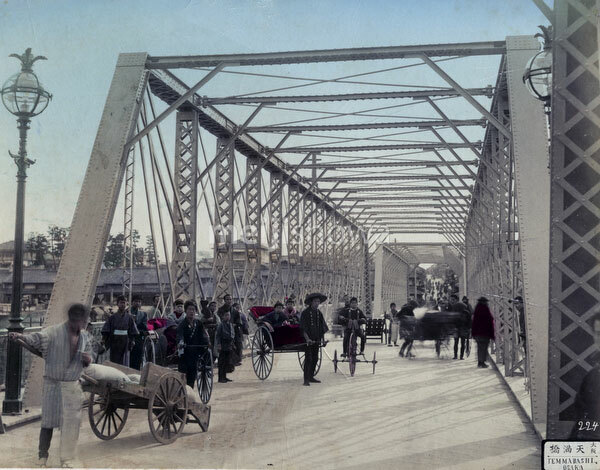 The original wooden bridge was washed away by floods in July, 1885 (Meiji 18) and replaced by the steel bridge shown in this photograph in 1888 (Meiji 21). In 1935 (Showa 10), this bridge was replaced. The current Tenmabashi dates from 1970 (Showa 45).